It's best to wait until the price is right. Trying to time the market is foolish, but that's not the same thing as waiting patiently for a better price. A great investment at one price can be a terrible investment at a higher price, so valuation is critically important. Fitbit (NYSE:FIT), Waste Management (NYSE:WM), and Aratana Therapeutics (NASDAQ:PETX) are three examples of stocks that aren't quite ready to be bought. Here's what you need to know. Tim Green (Fitbit): The worst fears about fitness-band maker Fitbit came to fruition when the company reported its fourth-quarter results. Sales fell off a cliff as it became clear that the market for its products in the U.S. had become saturated. New products didn't help, and various write-offs made an already awful-looking bottom line even worse. Fitbit now faces the challenge of rightsizing its business and coming up with new products that can return it to growth. The task ahead of it is difficult, to say the least. Still, I find myself interested in the stock despite the company's awful performance. The brand is well liked and popular, and the main problem seems to be that Fitbit was wildly optimistic regarding demand. It's still a market leader, and the balance sheet is cash rich and debt free. I'm interested in the stock, but not at the current price. I'll need to get a better deal before I consider investing in this struggling company, and that means patiently waiting for something that may never come. Fitbit expects revenue between $1.5 billion and $1.7 billion this year, along with a free-cash-flow loss of as much as $100 million. The market capitalization is currently around $1.2 billion, although $700 million of cash on the balance sheet makes the stock quite a bit more attractive. Still, the company is losing money, so I need the odds to be heavily in my favor. It's not quite there yet. Tyler Crowe (Waste Management): Waste handling is one of those wonderful businesses that isn't likely to go out of style any time soon. It is one of those behind-the-scenes things we do everyday and give little thought to how much it costs for companies to come pick up our trash and properly dispose of it. 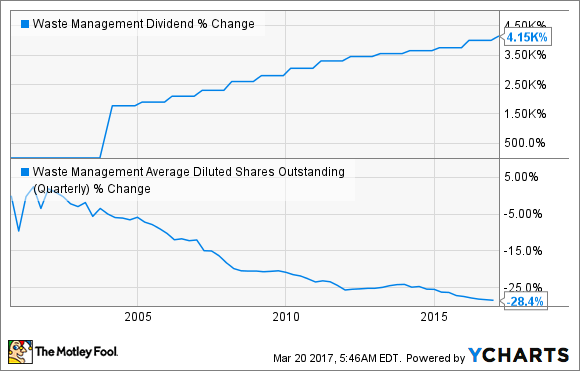 Waste Management has taken this tough-to-disrupt industry and generated a high-return machine that consistently returns value to shareholders with share repurchases and dividend increases. With this backdrop, it's hard to argue that this company isn't worth buying. There is one thing that you do need to consider when making an investment in Waste Management: It isn't a fast-growing business, and that means valuation really matters. Buying a slow-growth company at a high valuation multiple means that it will take a long, long time to realize the benefits of the purchase. Today is one of those times. Over the past year, shares of Waste Management have gained more than 25%, which, for this kind of business, is a lot. Much of that gain is predicated on faster economic growth and large infrastructure spending that was promised under the new presidential administration. As a result, shares of Waste Management are now trading at an enterprise value to earnings before interest, taxes, depreciation, and amortization (EBITDA) of 11.6 times, which is near the highest valuation this stock has seen over the past two decades. I don't doubt that Waste Management will be able to grow into this valuation. The question is, how long it will take, based on the fundamentals of the business and the tendency for stocks to revert to the mean when it comes to valuation. It would suggest that investors looking to buy Waste Management would be wise to hold off until we see a better valuation. Brian Feroldi (Aratana Therapeutics): Did you know that Americans shell out more than $60 billion each year to take care of their pets? It's true, and nearly half of that total is spent on trips to the veterinarian, or for medicine. That's a huge market, so it's no surprise to see that there are several companies that are focused on the space. Aratana Therapeutics is one such company. This small biotech already has five drugs approved that are designed to treat inappetence, pain, inflammation, and cancer in dogs. Aratana also boasts a handful of other drugs in development that are being researched as hopeful treatments for weight loss, cancer, pain, dermatitis, and more. Since millions of dogs and cats develop these conditions each year and pet owners are clearly willing to pay, Aratana's future is looking bright. Given all of the above, why do I think investors should wait before they dive in? First, I have concerns about this company's near-term financials. The company's commercial drugs are still very new to the market, so sales are still quite small. In fact, total sales last quarter were only $292,000, so the company is still burning through millions each month. Since it ended 2016 with only $88 million in cash, a capital raise could be in the cards. Given the recent share-price beatdown, the dilution rate could be quite severe. Second, the company got hit with a surprise information request by the FDA's Center for Veterinary Medicine related to the company's plan to outsource the manufacturing of its drug Entyce. This request is expected to delay the drug's commercial launch until late 2017. That means that the company won't be able to count on this drug to help move its top line anytime soon. All in all, while I think that Aratana holds a lot of long-term potential, I think the smart move is to stay on the sidelines until these big issues are resolved.